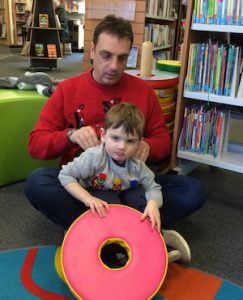 Story Massage adds an extra dimension to Story Time sessions at local libraries. 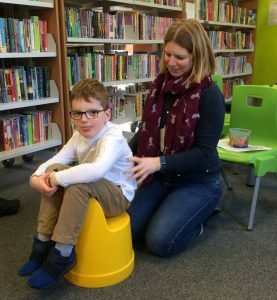 We talk to Alison Sellers, a Relax Kids coach and winner of our Best Practice Award, about the fun and interaction of her Story Massage sessions in branch libraries in two authorities – Wokingham Borough Council and Bracknell Forest Borough Council. 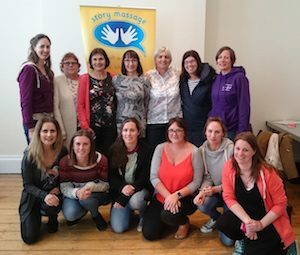 When Alison Sellers first trained in Story Massage in April 2017 she had lots of ideas for using her new skills. 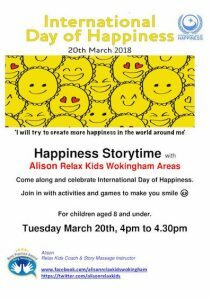 These included sharing Story Massage within her regular Relax Kids Wokingham Areas classes and as part of a special bedtime routine for her son. But her real passion was to share it within the community as her local library… and this has proved very successful. Alison began by contacting her local library in Bracknell where she ran her first Story Massage session. 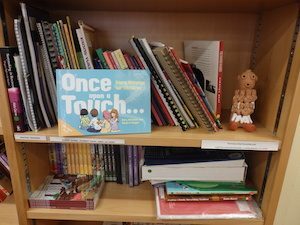 Feedback was so positive that the Community Services Librarian asked her to do the same at another branch. 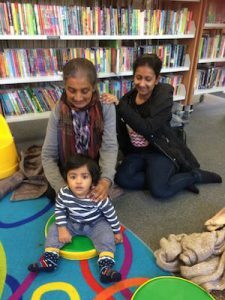 And before long, the Reader Development Officer for Young People and Families at Wokingham Borough Council was in touch asking her to share Story Massage at three branch libraries! Story Massage is perfect for celebrating events – and Alison enjoyed sharing massage stories on a happiness theme at the library. She made props and created massage stories all about happiness. “It gives me a warm, fuzzy feeling seeing the way that families enjoy sharing the joy of stories and nursery rhymes with each other,” she says, “Their faces are always smiling! It is such a great opportunity to share the benefits of positive touch with people who might otherwise never get the chance to know how good it feels. I have lots more ideas for special themed story time sessions at local libraries too! Alison has also made her own bookmarks to take away after the sessions. “It’s a good prompt to be able to share the massages with their family and friends. And it may create the spark for the child to create their own massage stories,” she says. 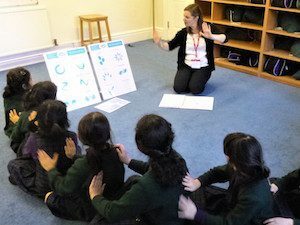 Story Massage combines the benefits of positive, respectful touch with the creativity and engagement of storytelling making it suitable for all ages and abilities. Ten simple massage strokes form the basis of the Story Massage programme. These strokes have a simple name, such as The Circle or The Sprinkle, and an easy to recognise symbol. No clothing is removed and no oil is used. 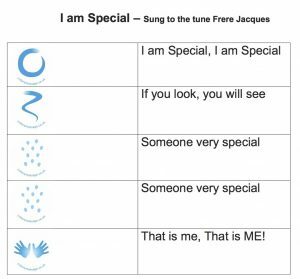 Stories can be taken from our Story Massage book, adapted from favourite stories or songs. Or you can work together to create your own stories. Are you inspired by the way that Alison is running Story Massage sessions in local libraries? Would you like to train to use Story Massage in your work or home? We run one day accredited training courses held around the country for individuals and groups. These days can also be organised as in-house training sessions. And we now have a popular online training option.